Make Your Own Dentures! A Dentist Explains How to Do It. The adverts for "make your own dentures" might sound a bit like "how to take out your own tooth" or "do-it-yourself eye tests". Taken literally, it would be just about impossible for someone without any dental training to make their own dentures, all on their own. It's quite a complicated process to get right, and the tools and equipment you need would normally cost more than just getting a set of teeth made by a dental professional! So how can it be done? How on earth could a normal guy or gal make their own dentures, when it take a dentist years to learn? It IS possible to do the work yourself at home! I highly recommend the DVD on how to do this by Garry Rhyne, an experienced dental technician who has put together an excellent video, and also supplies the teeth. Read on to find out more! SO IT IS POSSIBLE TO MAKE YOUR OWN DENTURES - with a bit of help! Garry will send you a kit by mail, which includes the DVD, instructions how how to measure up the teeth you want, and a list of a couple of tools you will need, with a guide on where to get them. This kit contains all the information you need to make your own dentures. It comes with written instructions and of course the DVD to help you along. You get to decide how you want the front teeth to look, and also pick the color of the teeth. These days, more folks are picking the lighter colors that give the appearance of having had tooth whitening! You also get to pay especial attention to how your dentures will fit, and of course you know better than anyone about any little “problem areas” you may have, such a tender bit of jaw bone or gum where you want less pressure from the denture. First, impressions (or “moulds”) of your gums where the dentures will sit. Second, you cast those moulds into plaster, to make a replica of your jaw. Third, you take the teeth that you have selected (and Garry will send you these), and position them on the replica of your jaw using wax. Garry’s video is excellent in showing you how this should be done. This step ends up in you having your new teeth set up in “trial wax dentures”. Fourth, you get a "trial run" of your new teeth! 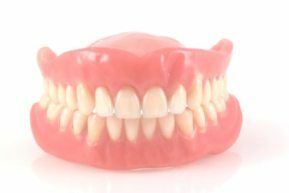 You can put these wax dentures in your mouth and see how they look. and how that color you selected looks! Again, once you are done, you go ahead and complete the processing into acrylic.Finally, you get your finished dentures! What are the advantages of doing things this way? By doing the work yourself, you can reduce the cost of new dentures by around 90%! On average, a full set of upper and lower teeth costs around $900. Garry Rhyne’s DVD will show you how to make your own dentures for around $25, plus the cost of the tools you will need, which is minimal. Also, you can do this no matter where you live. If you have access to the U.S. mail service, you can use Garry’s DVD! It may be possible to get new dentures at a cost halfway between that of home-made dentures and full-on dentures made by a dentist if you are able to attend an office belonging to certain dental groups, such as Affordable Dentures. But you can only do this if there is an office near you. I would like to make it perfectly clear that I have ABSOLUTELY NO CONNECTION whatsoever with Garry Rhyne NOR with Affordable Dentures. I have written about them because I believe that they offer services that are of value to a number of people. So, how does that phrase "make your own dentures" sound now? Maybe not quite so odd as before! It may not be for everyone, but a dentures-by-mail service is definitely worth looking at if you are searching for inexpensive dentures, and are happy to do the work yourself.